Responsible for moving refrigerant through the refrigerator and pushing warm air out of the appliance through condenser coils, the refrigerator’s compressor is an important component. Since the compressor uses refrigerants, it must be repaired or replaced by an EPA-certified technician. A compressor that runs constantly without achieving the right refrigerator temperature is a sure sign that there’s a problem. When all systems are working correctly, your refrigerator’s temperature sensors trigger the compressor to stop when the ideal temperature is achieved. So, while compressors operate frequently throughout the day, they shouldn’t run continuously. Unusual noises also often accompany compressor failure. There are a variety of components such as compressor fans and motors that will make off-putting noises as a result of their failure. Unusual smells may also point to compressor failure. A burning oil smell, for instance, is common in compressors with broken bearings. Compressors that click on and off repeatedly or trip the circuit breakers are also problematic. These symptoms can indicate a serious compressor overload problem, and you should call an expert out to check your refrigerator immediately. Considering the key role compressors play in your refrigerator’s operation, it’s important to catch potential problems early. When in doubt, call on a knowledgeable expert to perform your refrigerator compressor repair in San Francisco. A broken refrigerator can wreak havoc, forcing consumers to find a way to safely store perishables while waiting for repairs. For many consumers, though, the biggest concern is the potential cost of fixing the refrigerator. Since the average refrigerator repair bill in the Bay Area is more than $300, that’s an understandable worry. Luckily, there are a few steps consumers can take to minimize the cost of refrigerator repair in San Francisco. Often, failing refrigerators are actually caused by loose electrical plugs and other easily fixed issues. If your fridge isn’t cooling properly, double-check that the plugs are tightly in their electrical sockets. Check that the fridge and freezer doors are shut completely, and give your fridge an hour or two to achieve its optimal temperature after you’ve loaded it with a large amount of new food. You can often avoid a repair call altogether simply by taking these little steps. Make your refrigerator easily accessible to the repair technician. Tight spaces that require more time to navigate may increase your repair bill, so pull fridges out of tight spots if you can. Check your refrigerator warranty to determine if any of its systems or parts are covered by the manufacturer. If so, call the manufacturer first to find an approved repair technician. All California appliance repair companies are required to provide a written estimate of repair costs, but not all companies offer reliable initial estimates. Look for a company that is known for offering accurate and fair estimates of the cost of refrigerator repairs in San Francisco. There are hundreds of appliance repair businesses in the Bay Area, making it difficult to know which services are legitimate. Refrigerator repair is highly specialized, requiring detailed knowledge of refrigerants, mechanical systems and an understanding of the many innovative add-ons included in today’s high-tech fridges. Below are some qualifications to consider when looking for a top-quality refrigerator repair service San Francisco residents can trust. Appliance repair companies are licensed through the California Department of Consumer Affairs’ Bureau of Electronic and Appliance Repair. Consumers can check license status on the bureau’s website. The Environmental Protection Agency requires certification of repair professionals who handle refrigerants like chlorofluorocarbons. Technicians who have EPA certification have successfully demonstrated knowledge of refrigerant systems, proper use and appropriate disposal. Finding a technician who is responsive and prompt is also important. Look for companies offering extended weekday hours and weekend appointment times so that you can schedule convenient repair calls right away. There are hundreds of different refrigerator models in Bay Area homes, and high-caliber repair companies can service them all. A quick look at most repair companies’ websites reveals the brands serviced. The adage that you get what you pay for is often true with appliance repair, but you don’t want to pay unnecessarily high repair bills. Respectable repair companies offer reliable estimates and are happy to take the time to explain costs. Look for businesses with a strong track record for long-lasting repairs using excellent replacement parts. Ever wished for a customized, innovative, and stylish house, with revolutionary appliances that set in as though they always belonged there. Demands for custom fit appliances are on a steep rise. Viking LLC has been the unrivaled competitor in providing state-of-the-art products to its customers. Owning the Viking professional kitchen line is nothing less than a blessing. Undoubtedly the kitchen’s central appliance is the refrigerator. But when these advanced appliances start breaking down, our hand crafted dreams turn into living nightmares. Most commonly the refrigerator’s thermostat goes haywire. These problems could occur in various parts. The air damper is a flap, which controls the amount of cold air entering the fresh food compartment, damage to which can result in over-freezing. The temperature sensor senses the temperature changes and automatically adjusts the damper, allowing demand-based defrosting. Finally, if the brain of the refrigerator – the Main Control Board –is damaged, the refrigerator can neither sense nor respond to the temperature changes. Gradually, using the wrecked refrigerator becomes painfully time consuming. However, these minor issues are nothing to fret. With expert care the refrigerator’s functioning can be optimally restored. Your dream home deserves the best of care, that’s why Metro Appliance Repair is here. We understand your hassles and offer the best rapid response in San Francisco. Our expert technicians are skilled in handling Viking Refrigerators and other appliances with great care and precision. Allow Metro Appliance Repair keep your dreams alive. In the contemporary scenario, folks are adopting electronic appliances to make their daily life’s operation easy. A number of appliances are in existence of the present markets, which are used by the people on a large scale. As the thing is already proved that every electronic appliance must require repair and service after a specific time period and sometimes after a fault occurred in the device. So there is a need for the repairing service, which can unravel the occurring problem. The refrigerator is one of the most using appliances in premises as well as in offices. With the help of this device, we can keep the fresh vegetable, fruits, and much more. It is also used by the people for managing the temperature of the water as per the need. These things can be considered as the most important feature of this device, which takes place on the top of the human’s general lifestyle. Speaking of the new refrigerator, the dealing of a new device is not an easy thing for everyone only when a fixable fault occurs. It is really an expensive option which increases the burden on the pocket of a person. So you must have to ignore this, because in the matter of crisis it may be wrongly selected. If you have a major fault, so you can opt the dealing of a new device. When it comes to the minor fault, you have to switch the available option to make a right selection. 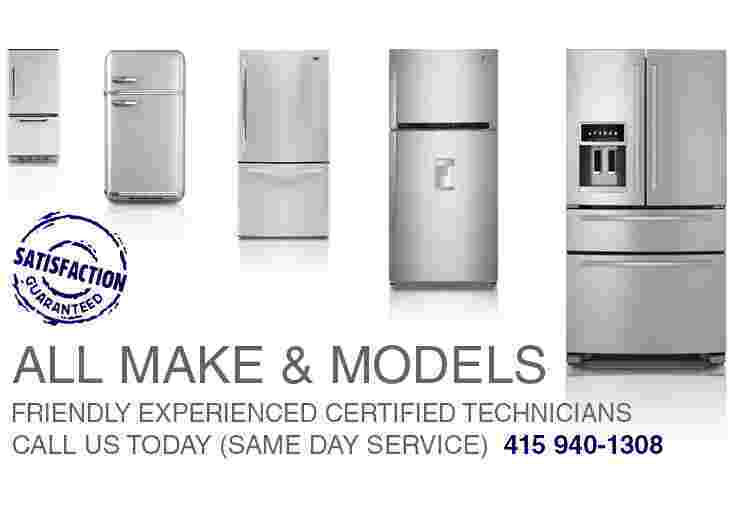 Most of the folks get confused when they think about the hiring of a refrigerator repair SF service, because in the current market numerous service providers are endowing the service with a variety. So it creates a confusion which pokes the mind of service finder, because everyone wants to hire the best and trustworthy service provider in SF, who can solve your problem at a reliable price. Some of us just hire the service on the basis of our experiences. But people who are facing this problem first time get confused themselves, where to find the reliable service provider. You should find the reliable service provider in your area to get the resolution to the existing problem. Just make your search on the internet for the same kind of service and take a look of the reviews and go through with a preferable or reliable one. The searching of the service is a superior option which will save both your time as well as money. This should be your first step to get the work done without any major risks. Any appliance repair SF starts with a company, which may have either positive or negative image in the eyes of the customers. Asking your friends or relatives about the best repair services that have had in the past can be greatly helpful. Reading the reviews and looking for the rating from genuine customers may help picking up the best alternative. It may sound bizarre, but it works greatly if you are going to hire an individual to get your problems solved. Do not hesitate asking about his qualification and experience as well. A professional repair technician is qualified and had passed relevant examination needed for the certification. His qualification may assure you about his quality and risk-free work. They are skilled to deal with the complication that arises during the repair and also they have permission to work on people’s appliances to fix the problem. Put some general questions- After selecting a service provider, call them or contact them and ask some of general questions. Your question may be clear about the cost, the comparison in the fee, time and the delivery. If you get satisfactory answers, you are likely to hire right refrigerator repair services. It is better if you call the technician to come to the home and diagnose the problem of your kitchen’s equipment. You should be very careful if you are going to hire Viking refrigerator repair SF. Look for the transparency- It is very important hiring a technician or an individual company, which is very transparent to the job. These individuals do not hide things like they tell you about what is the reason behind the breakdown of the unit? They also suggest you for the replacement of a particular part or the entire unit. They are very clear to their explanation about the damage of the appliance. These are a few simple and effective tips that should be kept in mind before hiring any technician and an individual company to fix technical problems of your kitchen appliance. Making the right choice for a repair service avoids risk of spending money on the same problem. Known for its reliability, affordability and plentiful mid-range options, General Electric is one of the top three refrigerator brands in the country. With the company’s focus on “ecomagination” and innovative new design, GE refrigerators are becoming infinitely more energy efficient and unique. Like all major appliances, though, even GE refrigerators develop some problems through wear and tear, time and use. One of the most common problems GE refrigerator owners experience involves the refrigerator door gaskets. These rubber seals line the edges of the doors, tasked with forming a tight-fitting seal that keeps the cold air inside the unit and the warm room air out. When the gaskets can’t form that tight seal, a number of problems can result, from an inadequately cooled fresh compartment and warm freezer compartment to leaking. On side-by-side models, closing the door on one side will often cause the side with the bad gasket to pop open. It’s not unusual for these rubber gaskets to deteriorate over time, especially if they aren’t cleaned routinely. Every so often though, a defective rubber seal can cause the door closure system to fail sooner than expected, prompting calls to qualified repair companies. Luckily, the solution may be as simple as replacing the door-sealing gasket, or as complex as replacing the entire door closure apparatus. An appliance that isn’t level may also cause or contribute to the problem, as can a fridge door with failing hinges. Finding a skilled and qualified GE fridge repair technician in San Francisco is important, especially because you have an investment in both the appliance itself and the food it protects. Metro Appliance Repair understands all of the money you have on the line with a malfunctioning fridge and is quick to respond to calls for service. Metro’s experienced appliance repair technicians are extremely knowledgeable in GE fridges and can rapidly troubleshoot your refrigerator’s sealing issues. If you want quick, reliable repairs on these and other GE fridge issues, call Metro Appliance Repair today.